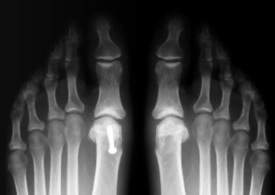 A bunion occurs when the joint at the base of your big toe becomes enlarged, sore and swollen. Your big toe may start to angle toward your second toe, or move underneath it. Women are most affected by bunions, which are often caused by wearing narrow, tight shoes, or high heels. A bunionette occurs on the other side of the foot, near your small toe, and is much smaller than a bunion. Wearing comfortable shoes with a wide toe-box at the first signs of a bunion appearing can decrease its growth and reduce any further complications. Resting the foot, using anti-inflammatory medications and icing the area may help. In some cases a cortisone shot at the base of the big toe may help. In cases when the bunion is causing severe pain, surgery may be performed to remove the bony bump and to realign the toe. Custom foot orthotics may be recommended, as they can relieve symptoms and furthermore slow down the progression of the bunion(s). Ignoring a bunion will lead to increased pain and the chance of contracting bursitis, when the small fluid-filled sac next to the joint becomes inflamed. Depending on how severe your bunion is, your foot can become deformed and continue to cause chronic pain.